Here are the materials you’ll need. 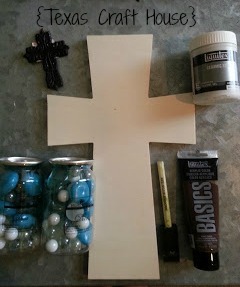 A wooden cross (I got mine at Hobby Lobby), marbles of your choice (I found these marbles in the floral section and really only used 1 “can”), a paint brush/sponge, acrylic paint of your color choice, some kind of pendant to put in the middle of the cross (check the jewelry section or home section for something small), and small tub of ceramic stucco (in the paint section). 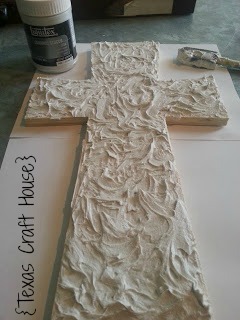 First, paint the ceramic stucco onto the cross. I tried to add as thick a layer as I could. It doesn’t matter how it looks when you are painting/rubbing it on… we’ll fix that in the next step. Then, I dipped my brush into my acrylic paint (I squeezed the paint into a disposable cup) and swirled it into the stucco on the cross. I tried to start making little swirly motions to make it look nicer. Really though, most of the stucco/paint will be covered with marbles so don’t worry about the looks too much. 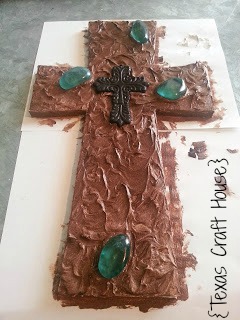 You could just mix the paint right into the stucco and then paint it on the cross – but I wasn’t sure how much stucco I’d need and didn’t want to waste it. I used about half the tub. 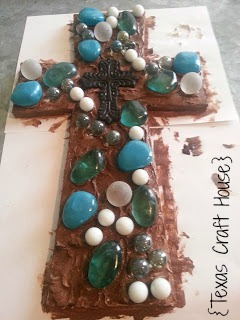 I would of added more but I had already used the stucco on a previous craft. I think the more you use the better it looks. 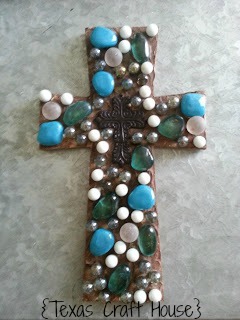 Push your pendant right into the wet paint/stucco mixture. 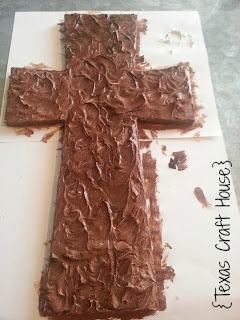 Once you place it how you want it try not to touch it anymore so it can dry/stick better. 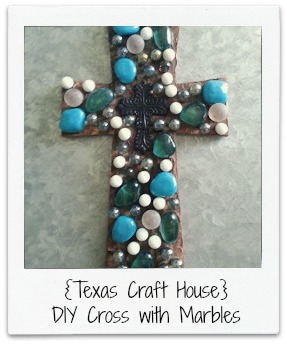 Now start placing your marbles randomly throughout your cross while the paint/stucco mixture is still wet. This is the fun part. Don’t like how a marble looks? Just take it off and use a different one. I think the more marbles you use the better it looks. When you are finished let it dry completely. You’ll be tempted to touch it but just leave it be. 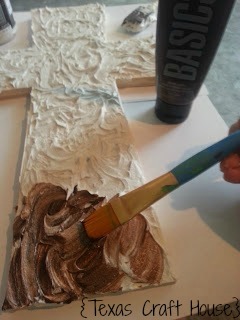 The paint/stucco is the adhesive for the marbles so it’s important to let it dry. I waited overnight… a good 12 hours. Then you can hang it up! 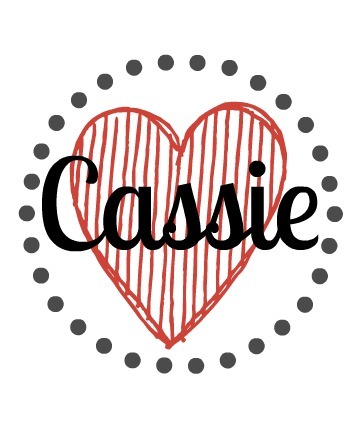 You could make this as a gift and match it with color schemes for baby showers, weddings, housewarming, etc. Or just make it for yourself. There are so many marbles to choose from. You could mix up the colors and sizes. You could make a pattern. The pendant in the middle could be anything. These are so expensive at gift and specialty stores, now you can just do it yourself. Actually, yesterday I went to my local thrift store and found a gallon Ziploc bag FULL with all different colors and shapes of marbles for $2.00! I was so excited, can’t wait to make another one. How would you hang these???? Not nailed surely. 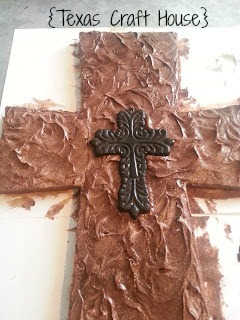 Do the crosses come with something to hang them by? I’ve seen some crosses come with a little notch in the back specifically for a nail. 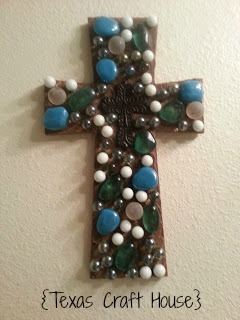 Mine didn’t have the little notch so I hung mine up with two nails, slightly spaced out on the wall and setting the cross so the arms sit on the nails. It’s worked perfect for me. There are also inexpensive hanging kits (sold everywhere) you can buy where you can attach something for it to sit on the nail. Where did you find the ceramic stucco? I can’t find the stucco. Hi, I found it at Michael’s in the paint aisle. 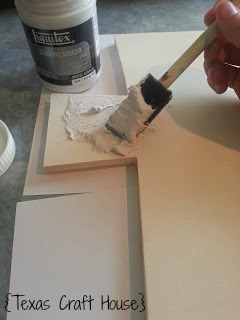 It’s towards the end of the aisle with other painting mediums like gloss, and gesso. I have seen it at hobby lobby, too. 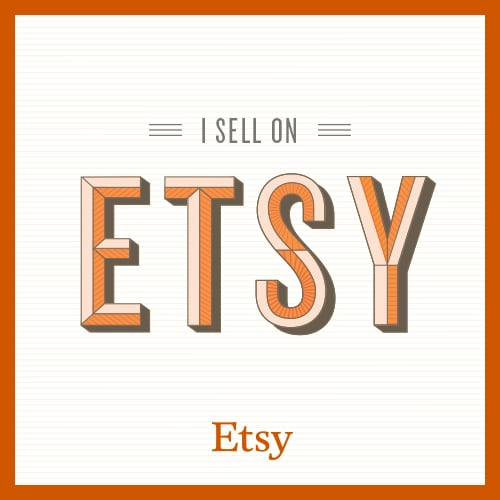 They usually have a small board of samples to see what it looks like on wood or canvas.